As many readers of this blog will know, day 2 of the Sydney (cricket) test in January each year is “Richie Day”. I have since discovered that the Richie’s have their own website with details of what you have to do if you want to be one. There is even a Richie’s code of conduct that must be abided by. 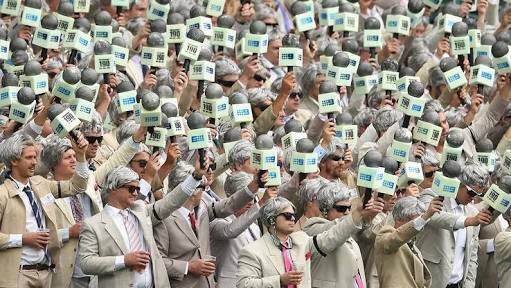 I was at the SCG on Richie Day this year. The Richies had 3 trumpeters amongst them. It was quite amusing when Nathan Lyon’s new spell was heralded with a rendition of “The Lion Sleeps Tonight” (the Tokens 1961, wimoweh etc etc). However, I did wonder how could it be that an environment so hostile to the beach ball could be trumpet friendly. The answer is in the Cricket Australia conditions of entry which prohibit the bringing in of any “stadium horn (including without limitation, a vuvuzela or caxirola), loud hailer or similar device“, but is silent on other instruments. Interestingly the corresponding conditions for the Waratahs and the AFL both provide that prior written consent is required to “bring into the Venue any musical instruments“. The A League doesn’t say anything about musical instruments, but does ban skateboards and rollerblades (which are not mentioned for the other sports). So, trumpets (but not horns) are allowed at the cricket but not at the football. The following general condition of entry applicable to all events brought a civil liability smile: “Patrons should be aware that sporting equipment such as footballs or cricket balls may be kicked or struck from the playing field into the seating areas during events. Patrons are advised this can occur at any time“.